Introducing any new pet into your household with other pets can be a worrying time and can lead to some unusual behaviours by your resident pets as they try to get used to the new family member. Often they adjust quickly to each other and after a short period of adjustment everything is fine. But sometimes problems can develop, so slow gradual introductions are generally best. NOTE: Before introducing any new pet ensure it is healthy, vaccinated, wormed and has no fleas. 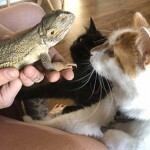 Gradual introductions often make the process a lot easier giving your new pet and your “pets in residence” time to get used to each other, slowly and gently. Initially keep your pets separate when you are not supervising them. Your original pet(s) should have much the same access to areas as before and the usual routine should be maintained as much as possible. The new addition should be kept in a neutral area such as a bathroom or garage. Make sure that the area is well lit and not too hot or cold and “pet proof”. Provide toys, food, water and bedding and for cats a litter tray or puppies wee mats if they are likely to be confined for some hours. Don’t put your new pet into the favourite area of your resident pet. Make sure to spend time with both pets so that the routine of your original pet remains much the same but the new addition also gets plenty of time. The next step is some limited interaction between pets. Make sure that the new pet is on a leash or in a crate or cage. If you are at all concerned your other pets may react badly to the new addition then place them on lead also. Allow them to explore each other at a distance at first. Any calm behavior or even ignoring of each other can be rewarded with calm praise or a treat. If initial introductions go well, with calm behavior, perhaps even a little sniffing and tail wagging then you can progress to feeding pets in the same room, but quite a long way apart. If this goes well every few days move the bowls a little closer together. If either pet acts aggressively then back of the distance again to one that is acceptable and then after a few days try to bring them a bit closer together. If your pet actively guards food and wants to fight over food do not do this step. If one of your pets reacts violently (hissing, spitting or swiping by cats, or staring growling, snarling, lip lifting by dogs) banish the pet showing the aggressive behavior into a neutral “time out” area (second toilet for example) and leave them there until they are calm, then try again. If they react aggressively again then leave them in time out for longer. If things are progressing well continue to offer pats, food and treats whenever the pets are together to show them it is a positive thing to have a new family member. Make sure to spend several minutes each day, ideally at least 5-10 minutes with each individual pet on their own without the others around. Once your pets are either not reacting to each other at all or are doing so positively allow them to be together unrestrained but still under supervision at all times. This may take hours or weeks to achieve. Remember to praise and reward them if they are interacting well together. Be prepared for possible negative situations by having a water pistol or whistle handy that maybe used to startle them and get them apart if aggressive situations develop and always be careful when handling pets that are aroused and upset. If these supervised interactions go well allow them to be together without strict supervision but when you are home and listen out for problems and check on them regularly to make sure all is going well. Once they have been fine with this for some time they will be able to be together when you are not at home to keep an eye out. Make sure there are extra water dishes, food bowls, beds and litter trays available so these do not become a cause of fights. Be patient, don’t rush your pets and don’t push them to interact if they are not wanting to. It maybe a much happier household with 2 individuals living side by side but separate lives than trying to force them to be best buddies. Don’t inadvertently reward bad behavior by misplaced assurances that everything will be OK. If your pet is acting aggressively, that is not OK. Separate them allow the aggressor to calm down and go back a step in the program and reward calm interactions to encourage good behavior. If you have tried slow introductions and things seem to be getting worse get help from a qualified behavioural trainer or a veterinarian. Bring the new cat into a neutral room and make it a pleasant and calm environment. Allow your cat or kitten to get confident in this location and make sure he or she is comfortable with all human members of the family. 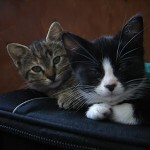 Consider using Feliway pheromone both in the new cats room and the rest of the house to keep all cats calm and relaxed. In the first stage of introduction use scent only. Get a face washer or hand towel and label it with each cat’s name. Each day rub the face and flank of the cat whose name is on the towel and store it in a plastic bag afterwards. Whenever you go to greet, feed or play with one of your cats wrap the towel of the other cat around your hand and present it to the cat you are greeting. This may initially cause the cat to back away, do not force them to sniff it. If they back away allow them time to settle and come forward to investigate. Once you can present the towel and the cat ignores it you can move on to stage 2. Stage 2 the swapping of smells. Now you can put the towels of the cats in one bag and let the smells mingle. Proceed as above and present the towels to each cat. Once the cat is reacting positively then you can rub the towels on objects that the cats might rub against such as furniture or even your legs. At this stage you maybe able to use a single cloth to wipe both cats with it. Make sure the cat is happy to accept rubbing with the cloth that carries the scent of the other cat. Once all cats happily rub against the cloth and objects rubbed with it is time for the next stage. Allow the new cat access to the rest of the house to explore while the other cat(s) are shut away elsewhere so it can find hiding places and escape routes should they be needed. Allow some time each day for this before returning your new cat to its room and allowing your other cat(s) back in. You might be able to have your resident cats out during the day and locked up at night and have your new cat confined during the day but allowed the run of the house at night for example. Once your new cat is confident in the house its time to move to the next stage. Allow cats to see each other but keep a barrier between them. Ideally a mesh screen can be used as it allows odours to travel but a glass door may also work. Cats should be given food at normal feeding times on either side of the screen or distracted with play. You can rub the screen or door with the towel you have been using for the scent swapping to help the process along. Move play and food progressively closer to the screen as long as the cats remain calm. The final stage allows them to meet. Once they are calm and content on either side of the screen with distraction allow them to meet with the screen between and if they remain calm after an initial greeting open the door and allow them to meet. Once your cats have started to mix in calm and relaxed manner and start scent marking areas with their chins in the house or even each other you can gradually remove environment barriers and changes and the Feliway. It may take weeks to months to reach this happy co existence so be patient and persist. Cats take time to adjust to new things and especially new cats. 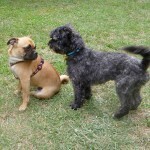 For more information on animal behaviours and behavioural issues go back to our behaviours page.